Friedman Fine Art presents historical and contemporary photographs of Chicago. 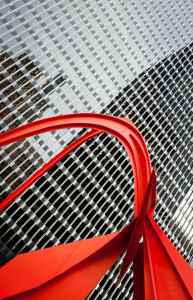 The Calder’s Flamingo, located in the Federal Plaza in front of the Kluczynski Federal Building in Chicago, has a curved shape and vivid color that contrasts drastically with the glass and angular steel in the buildings surrounding it. The Flamingo weighs 50 tons and stands 53 feet tall, composed of steel stabile, a material pioneered by its designer American artist Alexander Calder. Calder gave the stabile its unique color, which has been called “Calder red.” Despite its appearance, the structure is stationary, as opposed to a mobile structure. Flamingo was the first work of art commissioned by the General Services Administration under the federal Percent for Art program, which sets a percentage of its budget to public art. The plaza, surrounded by rectangular modern buildings, needed an arching art form with dynamic surfaces. Calder was commissioned to design the structure and he revealed the model for Flamingo on April 23, 1973 at the Art Institute of Chicago. The sculpture was presented to the public on October 25, 1974. For the past 38 years, the Flamingo has occupied a civic space known for serious debates. Chicago’s Federal Plaza is known as the site of mass demonstrations against anything from the war in Afghanistan to Obamacare, the Flamingo presiding over all the protests. Despite its large size, the open design allows people to walk under and through the sculpture, leading one to perceive it to human scale. The structure is open to the public daily. Currently, the General Services Administration is implementing a four-week restoration of the sculpture. The treatment includes coating the metal with a zinc-rich primer for extra durability, and applying a topcoat of “Calder Red” paint to prevent corrosion. To purchase visit our Chicago Photographs contact form.